This Alabama gem is nestled in Colbert County, south of Tuscumbia. This is truly one of the best kept, immaculate, trails that you will find in the state. This is a privately owned 700-acre area that serves as a sanctuary for native plants and animals. Sign in and out is required at the parking area, and you’ll be greeted by the most welcoming and helpful couple (Jim and Faye Lacefield) who own the property. They have made available laminated maps as well as typed hiking guides/descriptions of what you are seeing at different points in the preserve. 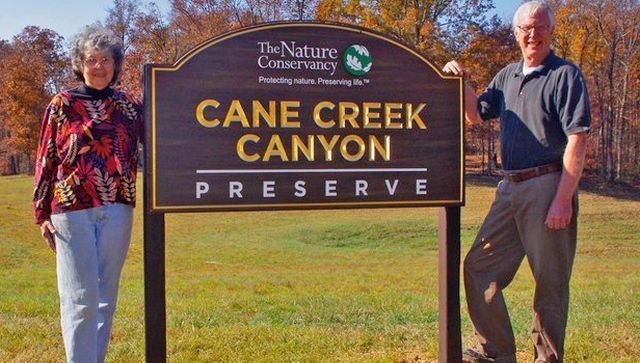 The landscape at Cane Creek Canyon consists of boulder-strewn streams, canyons, waterfalls, rock shelters (which where home to early native Americans), diverse flora and animals (The Preserve is an authorized wildlife release site, where injured animals may be entered back into nature), and boulder gardens. 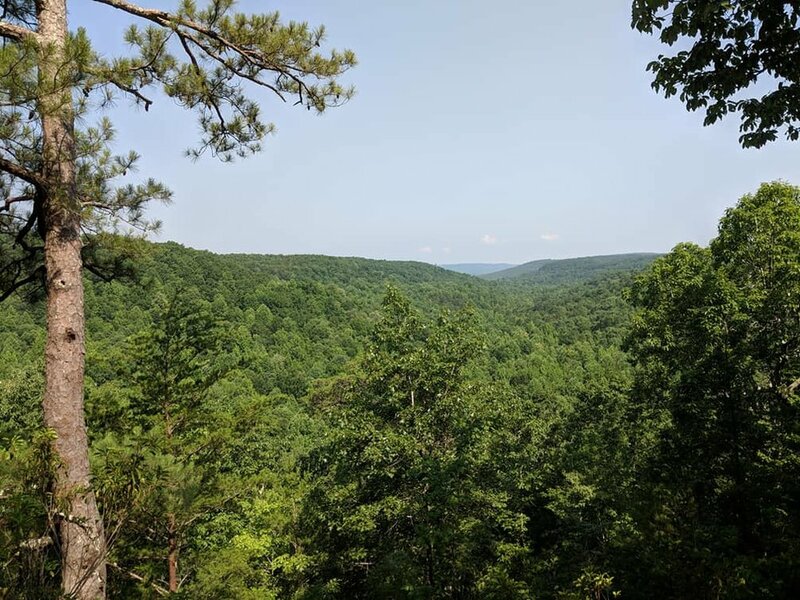 The Point Overlook, almost 400 feet above the canyon bottom, visitors enjoy a “broad vista that includes Wagnon and Hawk Pride mountains, and the valley between them where Cane Creek flows north to the Tennessee River.” The views from this overlook are breathtaking—any time of the year! 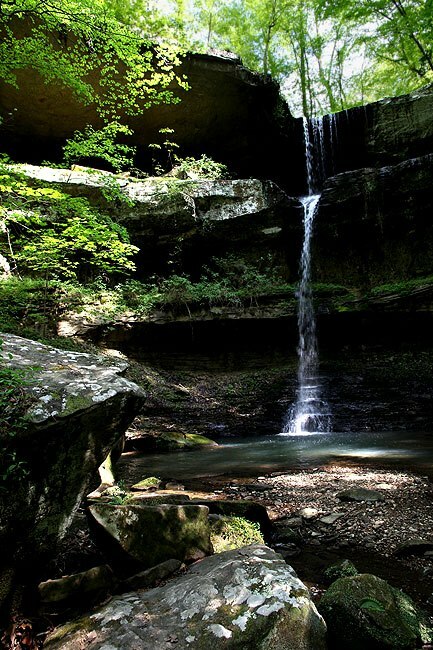 With 11+ miles of hiking trails of varying degrees, EVERYONE will find enjoyment here! After a day of hiking, why not pop in to the near-by iconic Rattlesnake Saloon. This is a restaurant like no other! At the parking area, you’ll load up on the Rattlesnake Taxi, an old pickup truck with benches built into the bed. You’ll be driven along a dirt road, around a sharp-angled steep hill in the “woods”, until it bottoms out. There you will see the restaurant--nestled into a massive rock ledge, tangled vines dangle over the edge, and if there has been recent rain, a waterfall can be seen trickling over the ledge as well. Get out and enjoy the world around you! Be sure to visit these Alabama gems while you’re at it!! For more information on the Preserve, please visit their Facebook page. For more information on the Rattlesnake Saloon Inn, click here. Stacy is the Ambassador for our Alabama chapter. 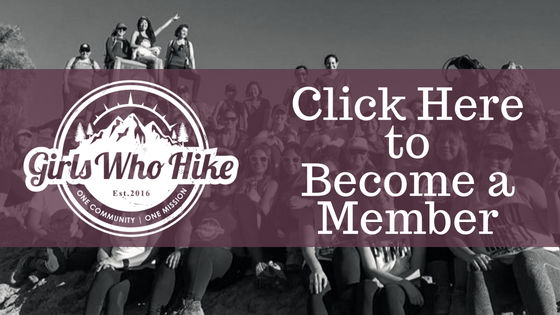 You can join her local meet ups and discussions through Girls Who Hike Alabama by clicking here.